So, you’ve gotten a new puppy, now what? One of the first things that this little guy needs are his vaccinations. Just like your children, puppies are susceptible to some very nasty and highly contagious diseases like Parvovirus. Focusing on that life threatening viral illness, which can be transmitted from infected feces in all sorts of ways including your shoes, clothing, another animal’s fur or water bowl. Parvo seems to be particularly rampant in our area and that may be due to the fact that the virus can live in the ground for more than a year and even though you may not have ever had an infected animal on your property, Harvey just may have picked up and deposited some on your lawn. Protecting your puppy or dog from parvovirus could save his life as the mortality rate can reach 90% in untreated cases. Treatment often involves veterinary hospitalization, a very expensive scenario, and even then, there is no guarantee that the dog will survive. 1. Make sure your dog is properly vaccinated. Puppies should receive their 1st set at 6-8 weeks with boosters every 3 weeks until he’s 16 weeks old. 2. Limit your puppy’s exposure to other dogs until he’s had at least his first 2 vaccinations. 3. Avoid places where he could be exposed to the virus, including dog parks, pet stores, play grounds, even your own yard (can you say paper training?). 4. When visiting your vet, carry your puppy in your arms and keep him on your lap. 5. Parvovirus is very, very difficult to kill. If you suspect your house or yard has been infected, you can clean with a solution of ½ cup bleach in 1 gallon of water. Regular soaps and disinfectants DO NOT kill parvovirus. Areas that cannot be cleaned with bleach may remain contaminated, including shoes, carpets, clothes, floors. 6. If your puppy is vomiting, has diarrhea, is not eating or is lethargic, you should get him to a vet as soon as possible. These are all symptoms of parvovirus. Remember, infected dogs may show only one symptom! There is no such thing as a lazy puppy. 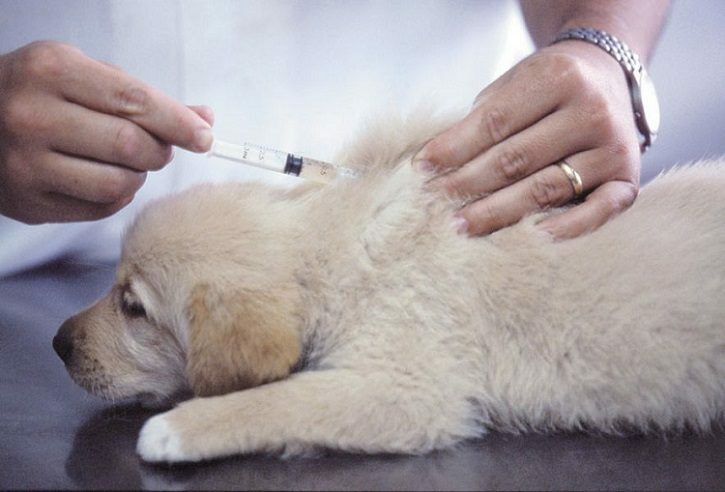 There are several clinics that are available for lower cost vaccinations, but you can still plan on spending about $100 in the puppy’s first 6 months to keep him healthy. Contact The Humane Society of Rockport/Fulton (361-729-8186) or Aransas County Animal Control (361-790-0151) for their next scheduled clinic OR visit the Wellness On Wheels website (https://wellnessonwheelz.com/module/eventsmanager/Events?show=calendar) for their event calendar. As always, please contact your veterinarian more information on what and when your animal’s vaccination needs are.